Occupying a corner of Kumho Asiana Plaza, Hard Rock Cafe HCMC serves classic Western fare with a soundtrack of rock n roll played by the house band and weekly guests. With special events like I love Vietnam tour, Coors Light giveaways and frequent special promotions, the Saigon edition of this global chain is one of the best spots in town to soak in American and British musical favourites amongst a swinging crowd of locals and expatriates. Located in Kumho Asiana Plaza at the corner of Le Duan and Hai Ba Trung, Hard Rock Café HCMC will cater to your Western food cravings. In fact, some Western favourites have been fused with elements of local Saigon cuisine, creating a tasty blend of traditional tastes. Check out their extensive menu, set lunch, kids' menu and Rock Shop for obligatory souvenir merchandises. La Brasserie Restaurant boasts the longest buffet counter in Ho Chi Minh City! Set in the Hotel Nikko Saigon in District 1, buffet selections range from local cuisine to international fare such as cold cuts and salads, your favourite roasts and grills, and tempting desserts. You will feel welcome inside this contemporary, spacious and cozy atmosphere whether for a quick bite or a leisurely breakfast, lunch or dinner. La Brasserie Restaurant is one of the top restaurants in Saigon. It offers an excellent international buffet station for breakfast and dinner. A la carte menu and set lunch menus feature Asian cuisine and International favourites. La Brasserie is also available for private events where you can entertain your guests in an inviting atmosphere while enjoying the bustle of Ho Chi Minh City. The Hotel Nikko also have a fine dining Chinese restaurant Ming Court. Beautifully situated on the ground floor of New World Saigon Hotel’s lavish lobby, this spacious high-ceiling setting faces the 23/9 Park with pristine floor-to-ceiling windows. Hosting one of Saigon’s most popular seafood buffets featuring local lobsters, slipper lobsters, crabs, shrimps, oysters, and snails to name few, Parkview also offers a whole day a la carte menu with an array of local and international specialties. 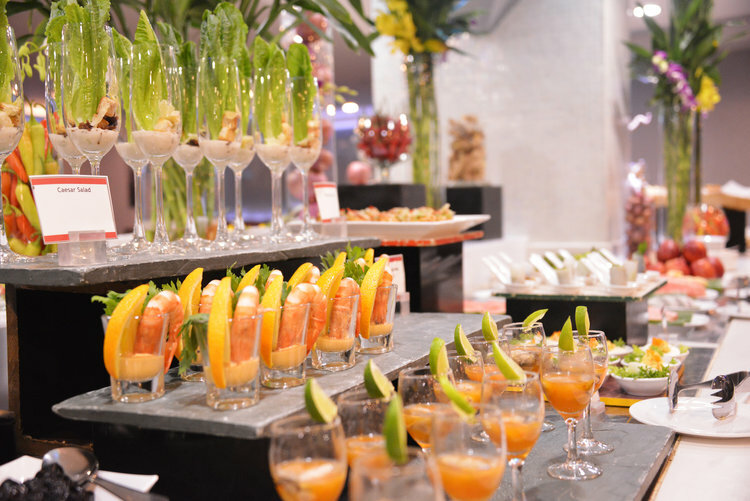 Gourmands and novel foodies alike will be delighted to find a wide variety of culinary delights, including eclectic pastries from New World Saigon’s master chef. City Pass visited the coveted buffet to find out for themselves what this seafood-centric eatery had to offer for our local and international palates. City Pass Guide visits Ho Chi Minh City’s Gem Center to try out their top-floor establishment, The Log Restaurant in a fantastic winter-lodge-style setting. The Log Restaurant is in a realm of its own: all-wood interiors, a chic bar-lounge overseen by two giant moose heads (a present from one of the managers’ friends) and a winter lodge aura and aroma that’s starkly out of place from the city’s usual restaurant environment. The restaurant is located on the seventh floor of the Gem Center, Ho Chi Minh City’s flashy event and dining complex. It was developed by Vittle & Vino, a U.S.-based company, and is managed by PQC Hospitality, which is owned jointly by two buoyant twins – Billy and Henry. The Log hosts lunch from 10:30 a.m. to 2:00 p.m. every day, and features a three course set lunch (VND 210,000++ - VND 280,000++) and a la carte menu (VND 70,000++ - VND 390,000++) and is already open for dinner: 6:00 p.m. to 11:30 p.m. for a la carte (VND 80,000++ - VND 780,000++), and 6:00 p.m. to 10:30 p.m. for the buffet (VND 1.2 million net per person, which includes free flow wine and soft drinks). While the food caters to particular palates (you’ll get a sense of what you might like after reading the Experience section), the place is a worthy visit, even if only to sample the selection and soak in the unconventional atmosphere. Toned down live jazz music flows like an undercurrent over the White Meranti floorboards, joining the low lighting to create an intimate space fit for laid back couples looking to chatter their evening away with some new world wine, or businessmen seeking a classy place to discuss matters in a less formal, more modish environment. A persona flows from the restaurant’s aesthetic. The Log’s theme is “tree house,” but the place screams “rocky mountain lodge,” with an alluring and spacious interior composed entirely of wood. Walking up the restaurant’s steps from the sixth floor, you can smell the Meranti exuding from the walls, ceiling and floor. The two giant moose heads and idiosyncratic art pieces add a personal homey feel that goes hand- in-hand with the two eccentric managers. The buffet area is well separated from the a la carte section, with rows upon rows of stations displaying fresh seafood on ice (brought over from Vung Tau and Phu Quoc Island), sashimi, dim sum, international fusion cuisine, a pastry counter (complete with chocolate fountain) and more, giving this side of the restaurant a more communal vibe that meshes well with families and groups of friends. There are outside areas for both a la carte and buffet guests in two distinct settings – a garden milieu and a city-view area. The buffet is priced at VND 1.2 million per person and features over 120 dishes, including lobsters, oysters, prawns, crabs, dim sum, sashimi and much more. You are greeted with smiles as you ascend the wooden steps to the restaurant, setting a respectable tone for the evening. The wait staff’s English may not always be fluent, but everyone is polite and tries to live up to the level the restaurant presents itself. The Log Saigon's managers Billy and Henry sometimes make the rounds and ask how everyone’s enjoying their food, occasionally sitting down for a chat and a laugh. 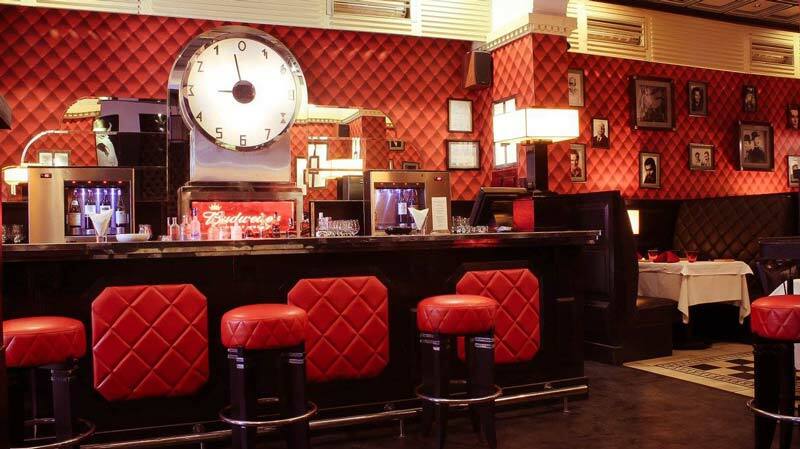 The bartenders are knowledgeable in their spirits and serve a variety of whiskeys and balanced cocktails with finesse. For our meal we dabbled in a few Western signatures, along with some standard items both sides of the globe might likely enjoy. 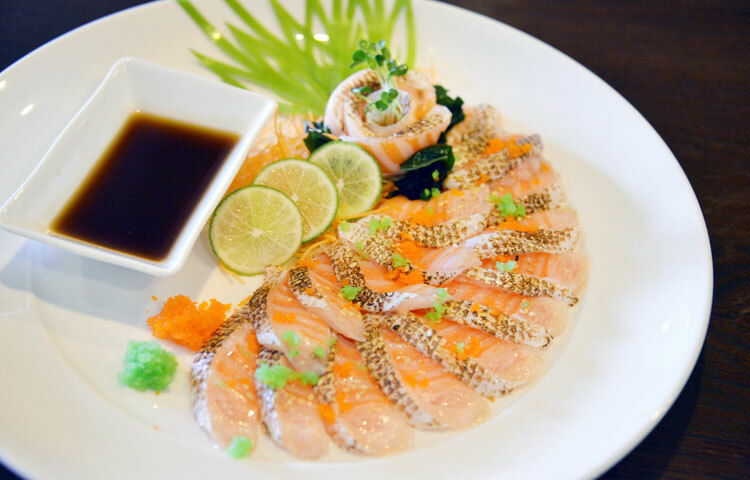 Salmon salad (VND 180,000++): You are given a side of citrusy dressing for the salmon salad. The mixture may be spicy for some, and it’s best to first dab a smidgen of your greens into the dressing to test the waters. We found that the spiciness paired well with the salad when used in moderation. The salmon itself was soft, thin and a tad buttery, and the greens were fresh. If you find the sauce overbearingly zesty, ask for some olive oil or another dressing instead. Baked chicken slice stuffed with foie gras (VND 350,000++): If you’re feeling a bit gluttonous, we’d bump this up to a must-try at The Log. The dish is comprised of several hors-d’oeuvres consisting of chicken strips hugging some viscous foie gras and a few bits of vegetables. The chicken is juicy, and the foie gras, if you’ve had a quality goose or duck liver spread before, is nothing too distinct, but the unctuous, melted filling goes well with the crisp chicken and vegetable bits. Grilled rib-eye with miso truffle sauce (VND 420,000++): Opt for the rib-eye if you’re not a regular steak eater. If you’re hailing from the U.S., you might want to stick to the more seafood-centric dishes, since the portion size is average at best for an experienced prime beef eater. But we digress: our steak arrived medium rare, with a bit of mashed potato and sprouts sprinkled on top. The inside was nicely pink and a tad bloody, the texture itself was soft and the meat somewhat fibrous. We picked the black pepper sauce, but would instead suggest a Porto wine sauce, or asking the waiter for a bit of salt and pepper for seasoning. Beef Wellington (VND 460,000++): The process that goes into creating the dandily-named Beef Wellington (makes you want to address it as Sir, doesn’t it) is quite elaborate. The Wellington is unassuming at first glance: a loaf of lustrous bread with some garlic cloves beside it, with a petite bowl of brown sauce on the side. The sauce is comprised of bone marrow and a wealth of other ingredients, steamed for 24 hours before being served. The inside of the Wellington is made of several layers of bread, mushrooms and beef. The meat is warm, tender and bloodless, and plays well with the softness of the mushrooms, the outside layer of brittle, crusty bread, and the thick, doughy bread directly underneath. Rum truffle (VND 105,000++): A smooth, dark truffle winged with tall chocolate honeycomb wafers. The savory presentation is inviting, and the truffle doesn’t disappoint, with a thick, even texture and chocolate that is not overbearingly saccharine. Out of 44 reviews on TripAdvisor, The Log Restaurant received 4 out of 5 bubbles. The reviews about the food are mixed – some love it and some not so much. The reviews for the atmosphere and décor are unanimously positive, and many times reviewers express awe upon first walking in. At the Cafe Saigon, breakfast is a true buffet and a la carte experience. The space offers five separate stations, each serving a different type of food or drink: Vietnamese cuisine is in its own corner of the restaurant; the juices and condiments are on the left, with hot waffles and cereals behind them and a range of cold cuts, breads and cereals adjacent; and at a station in the center of the space a smiling chef will cook you your own combination of hash browns, eggs, bacon, sausages and other hot breakfast foods, including their signature omelet from your own choice of fresh ingredients. Ask for tea or coffee, and check your menu for the Cafe’s a la carte breakfast options. The range of food at the Cafe Saigon is impressive, and the standard largely matches the range. A la carte menu is available from 6:00 a.m. to 11:30 p.m., with an additional lunch and breakfast buffet seven days a week and a dinner buffet from Friday to Sunday. The kitchen team puts an emphasis on using natural, nutritious ingredients in food, believing that over-seasoning and using chemical products only smothers the taste of a good dish. If food is designed, prepared and served well it will speak for itself, and a good chef knows the potential of simplicity. At both breakfast and dinner you can choose from a range of freshly baked loaves and rolls, traditional sliced toast and French baguette, croissants and sponge cakes. Gluten-free options are on offer at the buffet, and in all the menus there are a number of options that don’t contain gluten simply because it is not an ingredient. This is especially true for the Cafe Saigon specials at the grand dinner buffet, which focus on light, aromatic seasoning and tender juicy seafood. The grand buffet itself, open from Friday to Sunday, offers a very wide range of cuisines and is definitely worth a visit. For VND 799,000 per adult you can expect an almost overwhelming variety of cold cuts, bread, salad and a range of canape from sushi to a cheese platter, delicious stir-fries and grilled pork crackling, traditional Vietnamese noodles and a wide variety of seafoods, not to mention over 10 different types of dessert! Bellany ice cream is available at every meal, though most popular for breakfast, and can be combined with fresh fruit or a number of Vietnamese and Continental style cakes. But it is the Cafe Saigon’s unique combination of magnificent buffet and a special a la carte menu that really sets this restaurant apart. The concept is that guests can order from the signature a la carte menu, and whilst they wait they can enjoy the canapes, cold cuts, breads and other foods from the buffet. There is no rush for the a la carte dishes, and guests are never left waiting for their food to arrive. Though it is an intrinsic part of the Cafe Saigon buffet concept, the a la carte menu is in fact served all week and its signature dishes alone bring customers from all over Ho Chi Minh City. It is a combination of a select range of succulent dishes, each quite small and using only fresh ingredients. All seafood is on display for your reference, and on the weekends while you wait for your a la carte food you can nibble at the complimentary buffet. From the a la carte menu we would recommend the Sauteed Garlic and Sweet Chilli Lobster for its juicy meat and light, tangy sauce. Every dish on the a’la carte menu is carefully spiced so that the natural flavors of each ingredient can be tasted. Another favorite of ours is the Deep-fried Sesame Salmon Fillet, served with char siu sauce. The leaf holds all the fish’s natural oils in the flesh, and keeps it moist and soft - it melts in your mouth. Lunch comes in the form of an a la carte menu, with a range of delicious signature dishes to choose from. Why not enjoy a glass of crisp sauvignon blanc with your meal, or perhaps a fresh coconut fruit juice. Cafe Saigon has a comfortable feel to it, and its low lights and smiling staff will make you feel at home. Classified as “casual dining”, the restaurant combines impeccable service with a relaxed ambience to bring you a pleasant combination of class and comfort. We recommend the lobster bisque for VND 249,000 to start your meal. 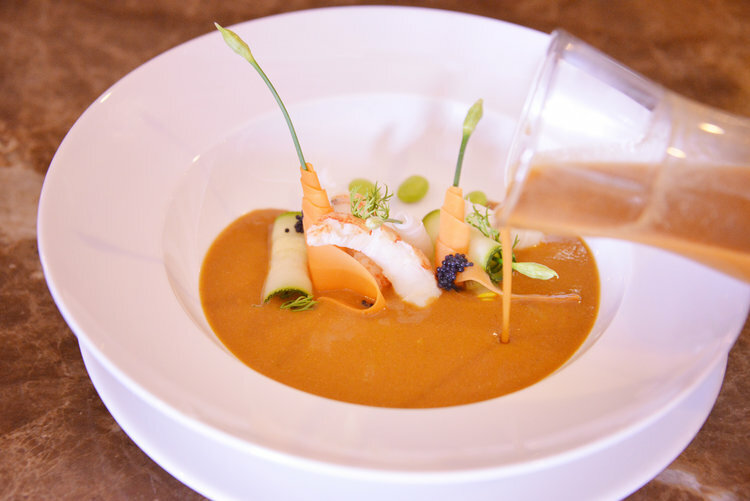 Inspired by the classic French-style soup this brand of lobster bisque is Executive Chef’s own elaboration. It takes the soup’s traditional creamy broth and combines it with a succulent lobster tail, the crunch of exquisitely thin vegetable curls, and a garnish of aromatic garlic flowers. The dish relies on a careful balance of fresh, simple ingredients, and is as light on the stomach as it is appetising. 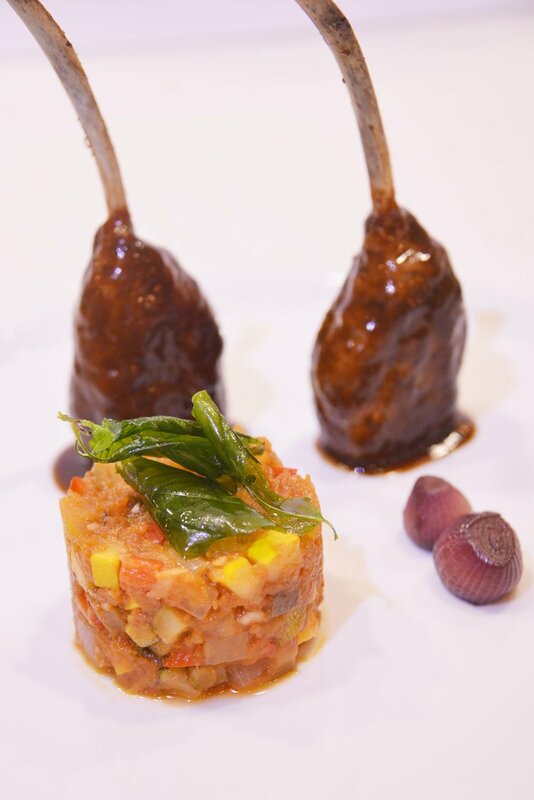 Second, try the signature lamb cutlet lollipops, for VND 429,000, named ‘lollipops’ for its unique approach to the traditional cutlet. This dish balances palate cleansing vegetables with the rich, succulent flavor of tender lamb. Following the recipe of their Executive Chef, the chefs at Cafe Saigon take a five-rib lamb rack, remove the two lesser ribs, and use them to coat the three remaining ribs with a delicious herb-filled mincemeat. These are then doused in a tangy gravy and served with a little mound of vegetable ratatouille, standing on end like 3 juicy lollipops. Slice a cutlet right across its middle to see the layers of rough meat and mince, and try combining ratatouille with both types of meat for a taste of the full range of flavors that this dish offers. Again, made with fresh vegetables and meat, and rich in protein, natural minerals and nutrients, this dish is also nice and light on the stomach. Finally, do not leave without dessert. Among a range of delicious and original choices, the Cafe Saigon’s Mousse Duo for VND 139,000 is our company favorite. The dish is served on a long, rectangular plate and is arranged into two lovely sections - a mound of Bellany mango sorbet is nestled on a bed of crumble at one end, while layered slices of coconut and pandan mousse, garnished with a toasted coconut wafer, sits opposite. The mousse is light and fluffy, and its creamy texture is directly complemented by the coconut wafer and a dab of fruity sorbet. 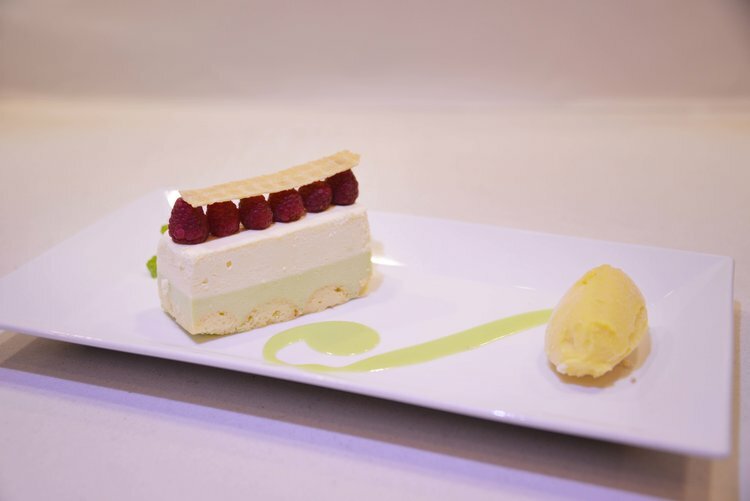 A garnish of pandan sauce connects the sorbet and mousse, and we would definitely recommend combining this with a bite of mousse and wafer to really grasp the flowery flavors of the dessert’s core ingredient, pandan. The Cafe Saigon is deliberately designed to cater to international palates. It not only offers a very extensive variety of cuisines and variations, he also emphasises natural, carefully balanced flavors and a lack of over-seasoning in his food, which allows for a wider range of appreciation and appeals to the majority of palates. Guests can adjust the seasoning of their food as they wish, but the dishes do have integrity in themselves. In-room dining is available, but uses a specific menu. Please see “Rooms & Amenities” for more information. Indulge in a seductive dining experience at the famed Saigon Steak restaurant, New York Steakhouse. The innovative menu features signature prime cuts of beef charred to perfection accompanied by decadent sides and desserts. 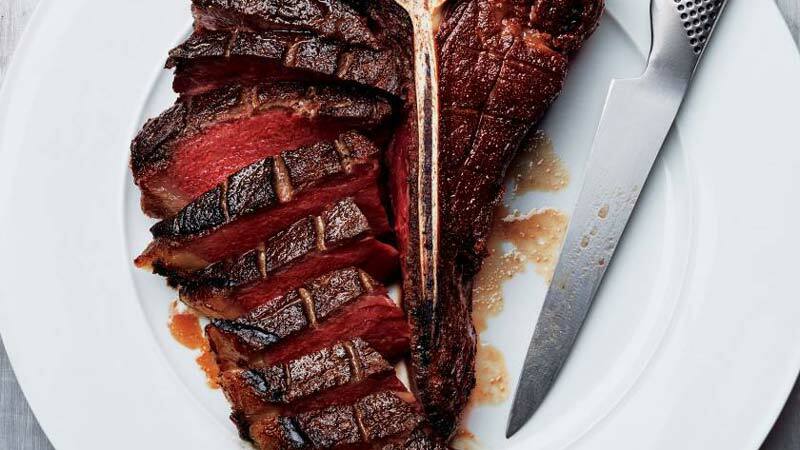 New York Steakhouse is the place where beef connoisseurs feel right at home, as the venue serves only the best steaks available. Find New York Steakhouse in the heart of HCMC on Nguyen Dinh Chieu. New York Steakhouse is THE steak restaurant in Ho Chi Minh City and in Vietnam. 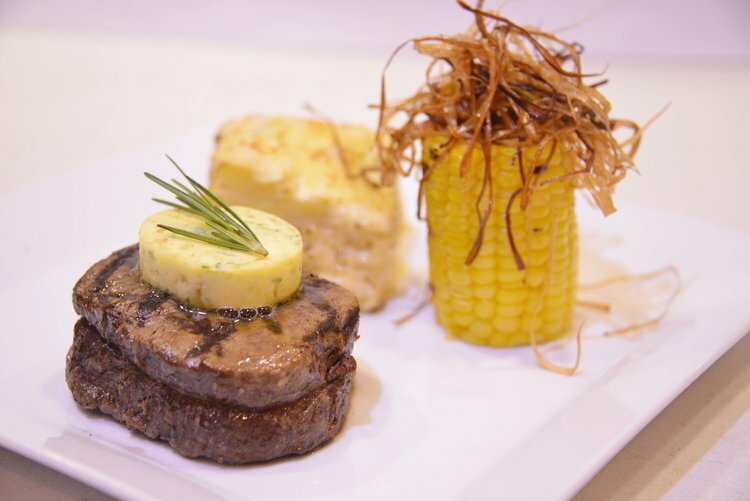 It serves up a whole range of beef dishes from Rib Eye Steak, New York strip Steak and Tenderloin. Their secret to cooking the perfect steak is not just in their choosing a fine piece of meat. No, the preparation has to be precise. You can count on New York Steakhouse to deliver in spades.